At Motor City Paint, we couldn’t agree more. We are proud of our people and the contributions they make every day to the success of our organization. We would like to introduce you to a few of our amazing team members. 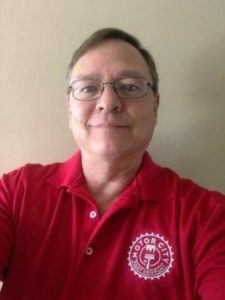 Chuck has been helping painting contractors, home builders and building owners grow their business and differentiate themselves from their competition since 1988, following his graduation from Ferris State University. When customers struggle to find paint contractors with hands-on knowledge, Chuck calls on his training in both architectural and industrial coatings by five nationally distributed paint manufacturers. In fact, Chuck learned to match color long before the color-match computer was invented. While the computer gets close, Chuck believes that the human element results in the perfect color choice. Chuck loves working for a locally-owned company where the focus is on customer relationships. When he isn’t working, he loves to travel. Chuck has been to 47 of 50 states and has visited every county in Michigan. Karen describes her position with Motor City Paint as a storyteller. She loves sharing the new and innovative products, building lasting relationships with clients, and solving problems for her customers. Karen credits the outstanding technical staff at Motor City Paint for helping her develop the skills necessary to assist customers. 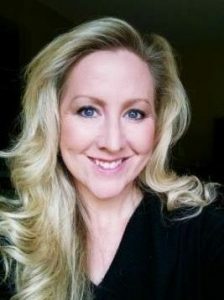 In addition to her degree in Communication and Social Science from Eastern Michigan University, Karen has participated in product training classes in Grand Rapids, Lansing, and Chicago. She also studied for her color certification online. Karen says the best thing about working at Motor City Paint is the customers. She believes they are best in the industry. They are open to innovative products and a simplified process that focuses on keeping their costs down and their colors consistent. Karen was born in Detroit and has been a Michigan resident her entire life. She is extremely proud to represent a Made-in-Michigan brand that has a high impact on the local community. Karen was drawn to Motor City Paint’s core values of faith, integrity, commitment, and community and believes there are no limits on success in the future. Steven was born into the industry as the son of the founder of Shelby Paint & Decorating. As a young boy, he spent time at his dad’s store and developed a desire to help customers. His dad taught him that he could only help a customer if he had knowledge of all the paints. The only way to learn was to ask questions. Steven asked questions of the employees and professional painters with decades of experience. He read everything he could get his hands on about paint. Steven is certified in color coordination, airless sprayers, wallpaper, window treatments, and paint. He is able to help his customers with every aspect of their design project. To Steven, color matching is like chemistry; add one thing to cancel out another. Choosing the correct undertone is the secret of a perfect color match and puts his skills to work helping his customers achieve their desired look. Steve appreciates the day-in-day-out rhythm of putting smiles on the faces of the customers he serves—especially when they are near tears trying to coordinate paint colors, wallpaper, and blinds. What many people don’t know about Steven is that he has almost as much knowledge of the human anatomy as he does paint. As an ice hockey player, Steven learned that “big guys fall hard.” Because he was tall, he had to have more balance on the ice, so he studied kinesiology on his own time to help him with that. Believe it or not, this knowledge is helpful today with teaching the staff and contractors how to steady themselves on a ladder. Everyone knows about the neck pain that comes with painting a ceiling. Talk to Steve. He will put his kinesiology skills to work and give you a few tips. 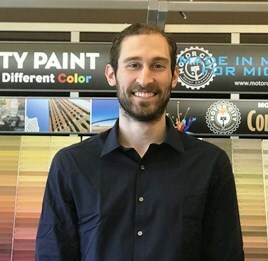 Dan Kearns has been color matching paint for 30 years and is “recognized as the best color matcher in the industry” by Brian Eisbrenner, president of Motor City Paint. Dan firmly believes that color matching computers are great tools, but nothing matches the experienced human eye for best possible matches. 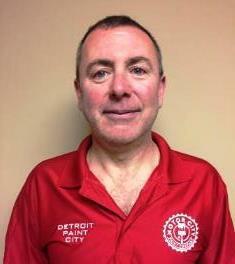 Dan enjoys working in a family-owned business as opposed to a large corporation. He cites the interaction with the owner, the staff members, and customers as the reason why a local small business is better. He appreciates having a positive impact on his customers and the local community. Dan is an active man. He has run the Boston Marathon and he’s also hiked to the bottom of the Grand Canyon. On most days you will find him at the store on Van Dyke in Utica helping customers find the perfect paint for their next project. When you need expert advice on your next painting project, consult the experts at any one of our three stores in Shelby Township, Rochester Hills, or Grosse Pointe. Find out why we are your source of a different color. Should You Paint or Stain Your Deck? Christine Johanns on 25 Detroit Inspired Colors, Named by You! © 2018 Shelby Paint and Decorating. All rights reserved.